The Organic Research Centre in Newbury, Berkshire was a lead research partner in a major pan-European project that has culminated in the development of ground-breaking research and advice to help make the organic and low-input dairy sector more sustainable and competitive. In working with farmers and other stakeholders, methods were developed to identify opportunities and novel strategies to enhance profitability, such as changes in breeding, health management and feeding strategies, and provide support systems for on-farm use. The five year Sustainable Organic and Low-Input Dairying (SOLID) project* funded by the European Commission, involved agro-scientists and farming experts from 25 institutions around Europe. The research highlights that although ‘one size does not fit all’ in the organic and low put dairying industry, the results are providing innovative solutions to enhance the sustainability and competitiveness of the industry. Significantly, the project indicates that organic farmers are open to change and innovation in order to achieve higher levels of sustainability. As well as developing a comprehensive website, including a Farmer Handbook** and summaries of the research findings aimed at farmers, advisers and policy makers, the project has also generated a series of published research papers. Working collaboratively with farmers in on-farm trials in the UK, SOLID-scientists showed that rotational, intensively stocked grazing of biodiverse pastures containing a mixture of legumes, grasses and herbs can maintain animal productivity at high levels. Studies by the Organic Research Centre also showed that the integration of animals (cows) with trees in the same plot of land could provide benefits in terms of shelter for livestock and increase total productivity. In on-farm projects in the UK and Denmark by the Organic Research Centre’s researchers strategies were investigated to supporting animal health and welfare as well as reducing antibiotic use on farms. These included farmer group discussions that emerged into on farm trials investigating the usefulness of alternatives to antibiotic use in addition to farm management practices, such as letting calves suckle their mothers for at least one month after calving in order to promote animal welfare. 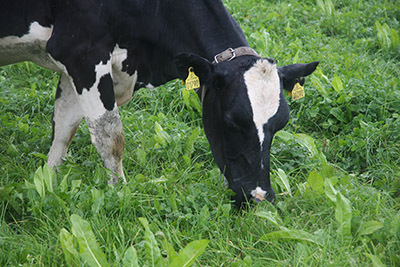 The research also provided valuable insights on how to decrease the negative environment impacts of dairy farming practices particularly reducing greenhouse gas emissions and nitrogen and phosphorus losses through carbon sequestration. Another key element of the SOLID project was to compare commonly used breeds with breeds perceived by farmers as ‘better adapted’ to specific environmental conditions within and across countries and regions, which allows for the selection of animals that are more suitable for individual herds or farms. The use of home-grown protein crops such as clover rich pastures, as well as lupins, beans and peas as animal feed was found to reduce the amount of imported soya from outside the EU and therefore can help to reduce costs and improve soil fertility. The researchers analysed the supply chain from farm to fork and worked with socio-economic modelling to predict the impact of more widespread adoption of low-input practices. For further information on this press release, please contact: Morag Walker on 07736 124097 or email: morag@moragwalkerpr.co.uk.